It’s just another beautiful Northern California fall day 56 degree morning and a 80 degree afternoon. Just a breath of air on the water, enough to make it cold on your wet hands. Soon the breeze dies and the water goes flat and Scotts Flat’s crystal clear water shows off its beauty with 20 feet of visibility. I’m taking a long time friend out fishing, he hasn’t been on the water in close to a year maybe more. It’s all about fun and getting on the water, let’s catch some fish anyways. Started by running up the river and throwing topwater baits. I threw the Whopper Plopper and he was throwing the Rover both River2Sea Baits. I’m not going to lie I only lasted a short time up in the cold air of the river. We ran back down to the main points of the Scotts Flat and the sun. Right off the bat we graphed some schools of bait and fish, they were in the 28 to 34 foot level which really shot holes in my topwater hopes. 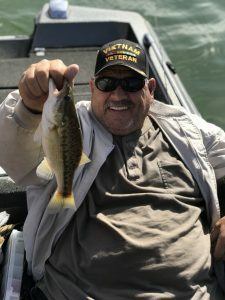 I had tied on a Strike king Coffee Tube (Amber-Copper-Green Flake) and a Zoom Trick Worm (Cotton Candy) started dragging them slowly through the area and my partner sets the hook on a nice 2.84 smallmouth bass. A few minutes later I hook up with another smallmouth but it comes off, after another thirty minutes of dragging the bottom we decided to run to the dam. I picked up the Whopper Plopper made a couple casts and the water explodes I land a nice 3.24 largemouth. At that point we decided if we are going to catch fish it might as well be throwing topwater. We made a move to the quarry area, both throwing Whopper Ploppers but no hook ups. We were getting off the water in about an hour so we ran to the river for one more try. Fished the incoming water of Deer creek with no luck then just worked our way down river fishing the steep walls finally as we got near some wood structure two more blow ups on the Whopper Plopper, unfortunately both fished missed. It was time to get off the water so we left the fish for another day. It wasn’t a serious fishing day but it was a lot of fun, as spending time with a good friend always is. Fall brings a slow drop in temperature, shortening of the days and the removal of the masses from the waterways. Hunters can’t wait for this time of year, it rings a bell inside of them, it signals great times and memory making days to come. As fisherman it brings a change that can be fortunate yet difficult. 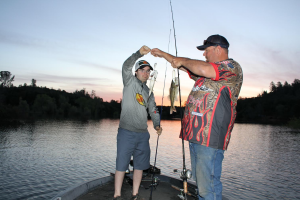 Bigger bass are reemerging from their summer haunts and the smaller fish will soon be few and far between. This is fall and anything can happen. We all have our favorite time of year to fish, in my opinion fall is not normally first on most anglers list. I’ve had several top five finishes in fall tournaments. I’ve caught some big fish this time of year. Not saying I love it but I have an affinity for it. Some of the keys I’ve found to fishing the fall transition are cover, water temp, forage and water movement. As the daylight hour lessens bass start looking for easy ambush areas close to deep water. Points are some of the first areas I like to explore. Not every point is the same, look for short points with deep water access. I like large rock points for better fish. By large I mean car hood size and bigger. Big bass like to suspend this time of year. Large rocks give them a place to hold at the water level they prefer. It also gives them cover and ease of movement to feed on the bait moving through the area. Targeting this area with trout imitations, rip-baits and topwater lures can be great producers. Next is points with grass lines at different levels. Grass on points can be really productive all day long. This cover allows fish to pick and choose the level they feel most comfortable as the sun angle changes during the day. Grass also allows you to target those fish with the same baits you may have caught them on earlier in the day. Simply adjust which grass line you fish and you can sustain the bite for a longer period of time. My choice for baits in this situation are Swim jigs, spinnerbaits and crankbaits (lipless and billed). The last cover I look for is standing timber. I focus here when the water temps really start to drop and the baitfish begin to school up in pockets. The timber will absorb heat and transfer it down the water column. Bass can use this as ambush for food and to stay a bit warmer. Bait will congregate in this area for cover and warmth as well. My baits of choice are jigs with bulky trailers to allow for a slow vertical fall. Drop-shot with a six inch worm. A weighted Senko can be very affective in this situation. We all know how much water temp can effect bass too hot they won’t bite, to cold no bite. How do you adapt to the many changes that can happen in the fall months? Look for stability and predictable changes. Tournament anglers don’t get to pick the weather they fish in. Pleasure fisherman sure do so put the odds in your favor and watch the weather reports for the lake you’re fishing. What you want to see is consistency over a few days. Rain, sun, temp, wind or snow does not matter as long as it’s consistent. The fish need time to adapt to changes so if you see change coming get on the water before. You can also wait till it’s not change anymore, its just normal. Forage this time of year is often plentiful. Crawdads, shad, bluegill, trout and other types of bait are preparing for winter weather. It’s how the bass are reacting to each that dictates how and when you catch fish. Bass will school up and attack shad, smelt and herring as they school as well. This can be a great way to get a limit but not necessarily the largest fish. Schooling bass will usually have the smaller most aggressive fish near the top and the larger fish towards the middle or bottom. These bigger fish will be waiting for the easy injured meal. 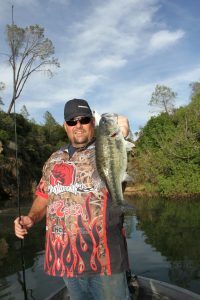 Targeting the fish on the bottom with Crawdad imitations and injured fish lures is a great way to get that bigger fish. Crawdads are not schooling animals but neither are really big largemouth bass. 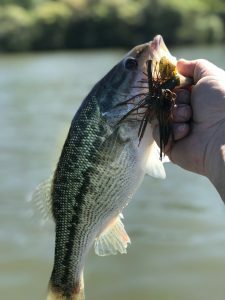 Focusing on big fish cover such as lay down logs, boulders and grass pockets with jigs and other crawdad lures gives you that chance to get a really big bass. Trout are beginning to move up from the eighty foot depth back into the upper water columns. This is the time of year I like to talk to the trolling guys and see where they are catching trout. 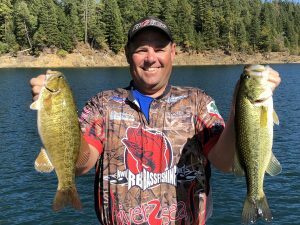 Fishing the short, big rock points with big swimbaits is a must for your chance at fall giants. One key I’ve found is to remember that trout like to face upstream when swimming and feeding. Position yourself in a manor that brings your bait upstream against the current, to give it a slower and more natural presentation. Bass are ambush feeders so keep your bait as close to structure as possible. This allows the bass to pin the bait against cover making for an easier meal to target. The last factor is current. 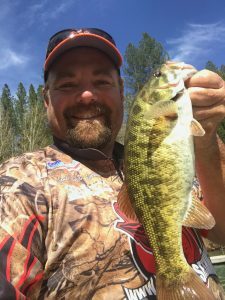 Fishing river systems you might already have a firm grasp on current and how bass use this daily. For lake and reservoir anglers this can be more tricky. Some Lakes and most reservoirs will start to draw down getting ready for the winter rains or to supply water for the salmon runs coming in the rivers below. This is where map reading and electronics work is very crucial. Finding the river channels where the water will flow down deep yet be close to structure changes can really produce some quality fish. Check with your local dam to see if they have a schedule of releases or the date they begin releases. In-flow of water can also be very productive. Dry creeks that start to flow with small rains and major rivers may begin to swell. Each bringing new microorganisms that will attract baitfish which in turn will bring bass. Positioning and fishing areas where current coming in hits a bank or a turn in the main river channel can be excellent fishing. It will concentrate the baitfish into a predictable area. Spinnerbaits, rip-baits and small swimbaits can really excel in this situation. These are some of the tactics I’ve used in the past to have success in the fall. I hope they can help you increase your catches this season. It can be tough or easy, if you use these tips I believe there will be more successful days than struggling ones. After my last trip to Collins Lake I wanted to get back out there and see if the giants were active in the spawn, what I found was very interesting. My friends Colin Peirce and the person best known as “Colin’s dad” Denis and myself all decided to head down to Collins lake for some late afternoon bass fishing. We arrived at the lake at 3:45 pm decided to run up the river arm after a friend gave us a good report of a recent trip he took. I started with a spinnerbait, Colin a worm and Denis a fly rod in hand rigged with a popper. We started fishing brush and bushes on the east side of the river, just about 50 yards north of the power lines. Fished along here for 30 min or so with no success, we changed lures a few times but never got any bites. Picked up and moved to the first incoming creek on the east side before the bridge, I noticed some shad activity so I broke out my Wake JR hoping to entice a big fish to commit to eating an injured trout. No bites on it but there were two quality fish that followed it out giving away their position. We threw a couple baits back where they came from but they were to savvy for us. We started working back towards the mouth of river changing lures, depth and cover as we went. Finally about mid way back a couple large fish followed the Wake JR back to the boat, Denis picked up a Senko (white,4 in) pitched it behind the bush they swam out from and first fish on. Unfortunately the fish got into the brush and couldn’t get it out, during the fight we noticed that it had a very large belly and was about a 3 pound fish. The large belly was the most intriguing thing we noticed, being the water was 73 degrees the thought was that the bass would have spawned out by now. Colin decided to tie on a Rebel Pop’R bait, was tossing it around the bushes and boom good size explosion but the fish missed it. Here is where this report gets its name, I decided to pull out the River2Sea Whopper Plopper. First cast got two blow ups but no hook ups, started working our way back to the incoming river with again several blow ups but no connections. Then as we approached the river I noticed the water transition point made a long cast into the colder water (62 degree) brought the Whopper Plopper back through the transition and big fish on. Now we had the baits A Whopper Plopper and a Rebel Pop’r were not being put down the rest of the evening. 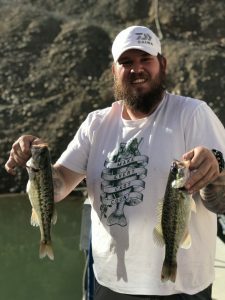 As we worked our way back out of the river we noticed the bass that we were catching and the ones we would see cruising all had the same thing in common, fat bellies. Our deduction is that even with the warm water temps the spawn hasn’t happened yet. We fished until dark which was about 8:30 pm ending our evening on the west side of goose island, flat-out wrecking the schooling Spotted bass from 1-3 pounds all on Whopper Ploppers and Rebel Pop’R. For only being a 4 hour trip it sure was packed full of good fishing. 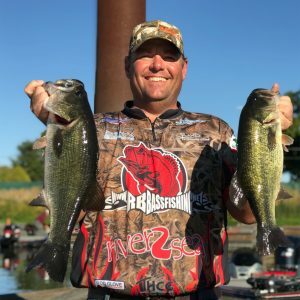 If you are looking to head out to Collins Lake be sure to pack your topwater baits, I’m sure you will agree nothing beats a good topwater bite. The north side of the lake had more bed fish on it but there were beds consistently all over the lake, the better fish were deeper towards the 8 foot depth but with the wind rippling the surface you really had to know what you were looking for to find them. By no means is this the end of the spawn in my opinion its only going to get better from here. 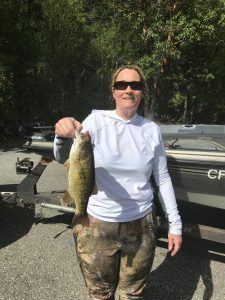 My wife was fishing two baits the tube and the drop shot,the bed fish were eating the tube and the fish suspended in the brush were eating the drop shot. She was just dragging the tube in 8-15 feet of water, normally the closer we got to a stump or a big rock that’s when she would get the bites. The drop shot was most effective just worked slowly next to the willow bushes, morning dawn worm shaken slowly then it would just get heavy (if it wasn’t a trout). 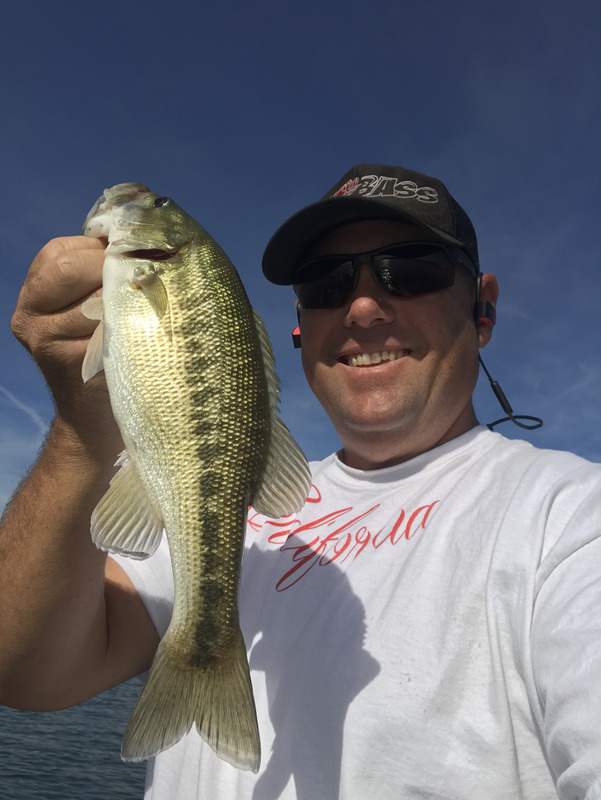 Its been a long time since I fished Collins lake but since I was giving a fishing report live on the radio that night, I thought it would be a good idea to check out the lake. I got a late start on the day hit the water at about 9:30 am. Made my first stop on the east side of the lake at some willows in 15 feet of water. 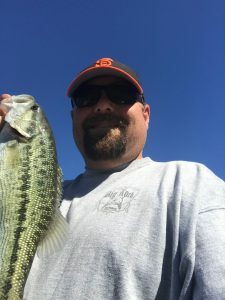 With the water temp in the high 50’s I felt like a jig might work well, on my fifth cast my hunch was right an I landed a nice 3.5 pound spot with a few more casts I caught another nice spot at 4.8 pounds. Those were the two best fish of the day but 25 fish later I wasn’t complaining. It’s December and tournament season is about to kick off. This would actually be the third pre-fish day for my partner and I but the first we had together. Oroville is currently at 699.77 feet a 3 foot drop from the last day I fished, the water temp is currently 49.9 a 4 degree drop in the same time. Previously we broke the lake into four parts Main Body, North, South and middle, he took two parts and I took two then compared notes and came together today to find what is hopefully the final pattern. 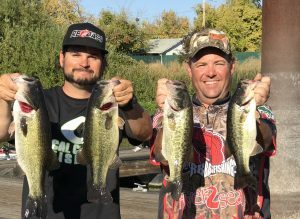 We started the day in the middle basin focusing on wood, hoping to stumble into some of Oroville’s scares largemouth population, worked for about an hour with no results except one broken off fish. Next we moved to the south fork switching our attention to spotted bass. Found a few here and there but never found any great size fish just the same ones we have found over the past month. Slowly but surely we worked our way back to the main body spot to spot. The only thing we secured in our pattern is that the reaction bite is nonexistent for us, soft plastics in shad patterns seemed to rule the day a slight change from the crawdad pattern we have been focusing on. One of the other big changes that has taken place is the number of fish we are catching is diminishing, two weeks earlier 30-40 fish a day was easy today was 15-20. The fish are moving slightly deeper with the cooling water, we had been catching fish in the 18-20 foot depth range now its 20-25 feet. Dropshots with 3-4 inches between weight and hook, Dartheads and shakey heads were the best producers. Colors in your favorite shad patterns will work, 4-6 inch seemed to have the best results. Rocky shores facing East produced more fish but if you pull up to a bank and don’t see fish on the graph move on. 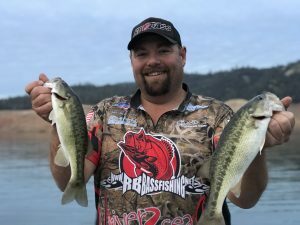 I can honestly say we will need to do more work to find the fish it will take to win but maybe this can help you have some fun and catch a few good fish next time you head out to Oroville. California Delta Ways “Not” to Win!! High Dollar Fishing Rod or Not?